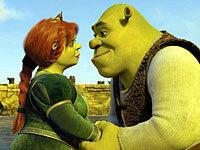 Overview - When Shrek married Fiona the last thing he had in mind was becoming the next King of Far Far Away. But when Shrek’s father-in-law, King Harold, suddenly croaks, that is exactly what he faces. Recruiting Donkey and Puss In Boots for a new quest, Shrek sets out to bring back the rightful heir to the throne. Meanwhile back in the kingdom, Fiona's jilted Prince Charming storms the city with an army of fairy tale villains to seize the throne. Fiona and a band of princesses must stop him to ensure there will be a kingdom left to rule! Movie sequels have it tough. They only exist because the public's love for the original film was so great that they want more of the same, yet at the same time a sequel must also deliver at least something a little bit different, or risk boring its audience to death with repetition. 'Shrek the Third' is a classic example of a movie that never quite successfully solves this dilemma, offering up too much of what we've seen before and too little of what we haven't. Of course, the original 'Shrek' wasn't all that blazingly original to begin with, with a story that borrowed liberally from classic fairy tales, and mixed it up with hip humor and a seemingly endless supply of pop culture references. 'Shrek 2' continued this approach, so I suppose it's no huge surprise that 'Shrek the Third' again plays it safe, delivering another narrative pastiche of other movies. You might think of this one as the 'Three Ogres and a Baby' meets 'The Lion King' installment in the franchise, where Shrek learns he's gonna be a papa, while at the same time struggles with the responsibility of being ruler of his kingdom. Unfortunately, the film adds little else of substance to this familiar thematic equation, and has so many returning characters and loose ends to tie up from the earlier movies that the story never gets much of a chance to live and breathe on its own. Simply put, there is a curious sense of obligation to the whole affair. The basics of the plot are amusing enough. When his frog-in-law suddenly croaks (har har, get it? ), Shrek (Mike Myers) discovers he's the next in line to assume the throne. This doesn't go down so well with the big ogre, however, who just wants to hang around the swamp with his faithful sidekicks Donkey (Eddie Murphy) and Puss 'n' Boots (Antonio Banderas). Complicating matters is the news from Fiona (Cameron Diaz) that she's pregnant, which throws Shrek into a major daddy-to-be panic -- especially when the size of her bulging belly would seem to suggest that more than one little bundle of joy is on the way. Then, suddenly, Shrek gets a break when he learns that there is actually another potential heir to the throne, a supposedly noble knight named Arthur (who actually turns out to be a gangly teen named Artie, voiced by Justin Timberlake). So Shrek sets off with Donkey and Boots to entice Artie to take the job, which leads to another whirlwind adventure and run-ins with various colorful fairytale characters. But there's danger, too, when the evil Prince Charming (Rupert Everett) learns of Shrek's quest, and pledges to stop at nothing in order to snag the crown for himself -- even if it means offing Artie, Fiona and anyone else who gets in his path. Ultimately 'Shrek the Third' feels more like a sketch show than a story. The burden of delivering a relentless parade of ironic zingers and satiric homages is crushing, and the narrative of the movie seems to be in constant danger of collapsing like a post-modern house of cards. The sheer desperation of the film's need to please overwhelms all, and any grown-up themes it attempts to explore are squashed by all the cynical cleverness. Although I have to admit a begrudging admiration for any movie that can somehow find a way to use the James Bond tune "Live and Let Die" as an appropriate funeral song for a dying frog, then only minutes later quote the ultimate '70s pity-party power ballad "I've Never Been to Me" as the theme for its villain, even with a slim runtime of barely 87 minutes, in the end I left the film more exhausted than I was exhilarated. The word "magic" is thrown around a lot when it comes to movies in this genre, but it's true -- the best animated family movies are able to appeal to all age groups, marrying universal stories with great visuals and truly inspired humor. Unfortunately there's nothing magical about 'Shrek the Third' -- instead, it simply distracts with soulless pastiche, eventually leaving us with only the illusion of having been entertained. Still, judging by the flick's healthy box office returns, it seems that the joyous residue left by the original film is enough to carry yet another installment. As such, I'm going to go out on a limb and recommend this HD DVD for fans of the franchise, even if only for a rental. 'Shrek the Third' may have all the resonance of a commercial for the original 'Shrek,' but, for many, it seems that may be enough. Man, I'm getting really spoiled. Only just last week, I had the pleasure to review two CGI animated titles, 'Cars' and 'Ratatouille,' both from Pixar and both boasting what I thought were absolute five-star transfers. Although I still think that the Pixar team is untouchable in terms of the visual wit and stylistic brilliance they bring to their best animated features, 'Shrek the Third' on HD DVD proves that no one studio has a monopoly on fantastic high-def video presentations -- 'Shrek the Third' looks every bit as good as the best animated titles I've seen on either next-gen format. A direct digital-to-digital presentation, DreamWorks offers up a 1080/VC-1 encode in the film's original 1.85:1 theatrical aspect ratio. Unlike a string of more recent animated films that have attempted to simulate a more "film-like" look (making background elements appear out of focus, adding grain, etc. ), DreamWorks goes the opposite route, with everything appearing so incredibly sharp that it's almost creepy. 'Shrek the Third' is incredibly dimensional, and is about as close to 3-D as you're going to get without a pair of red and blue glasses. The level of detail and fine textures can be astounding, and just about any scene in the film is easily demo material. The rest of the presentation is just as impressive. Colors are bold (particularly the striking icky green of ogre skin, and the fiery purples and oranges of the dragon) but never oversaturated. The image also avoids an over-processed look, with well-modulated contrast across the entire grayscale and deep, rich blacks that are free of heavy crush. I detected no problems with compression or other artifacts, and edge enhancement appears to be completely absent. 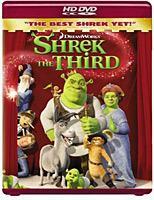 Simply put, this HD DVD edition of 'Shrek the Third' boasts a marvelous transfer that easily holds it own with the best animated presentations I've seen so far on high-def. That's high praise indeed. The audio on 'Shrek the Third' is a comparative disappointment, if only because the film's engaging sound design deserves better than the Dolby Digital-Plus 5.1 Surround track (at 1.5mbps) that Paramount/DreamWorks provides here. Why the studio continues to eschew high-res audio on such major releases as this and the recent 'Transformers' remains a complete mystery to me. That said, what we do get here is perfectly fine and capable in its own right. All of the 'Shrek' films are lively sonic affairs, with plenty of discrete effects to go along with all the zany action on the screen. Activity in the rear channels is almost constant, with nice directionality to the mix, well-done panning and a good deal of bleed to the score. Atmosphere is also nicely sustained during the few quieter bits, with everything from minute drops of rain to wind in the trees subtle but noticeable in the surrounds. Like most animated films, 'Shrek the Third' is an entirely studio-constructed soundtrack, so the caliber of the source is top drawer. It's clear, well-attenuated and quite realistic, and feels neither too bright nor too bland in terms. I did think the bass was a tad bit weaker than it might have been, but otherwise this mix is quite dynamic. Dialogue is also perfectly balanced, so no volume-matching problems here. It's impossible to know how much better this soundtrack might have been if Paramount had opted for high-res audio, but on its own terms this is still a fine presentation. Historically DreamWorks has done a pretty good job of providing well-balanced supplemental packages for its family titles, recognizing the needs of both kids and adults alike. 'Shrek the Third' continues that approach, although I can't say I found it to be their most successful effort. It just doesn't provide much of substance for either demographic, with the majority of the shallow bonus features feeling like they were constructed simply to add another bulletpoint to the back of the box. This HD DVD edition of the flick ports over all of the extras from the concurrently-released standard-def DVD, with each upgraded to 1080p/i. Note that this is also another one of those crazy discs that seem to use every codec imaginable -- the main feature and menus are presented in VC-1, while all of the video-based extras are encoded in either AVC MPEG-4 or MPEG-2. Regardless, the material looks great, and I was impressed with the consistent level of quality throughout. Let's start by looking at the more adult-oriented fare, which can all be found under the "Special Features" tab. Meet the Cast (11 minutes) - First up is a fun little featurette that introduces us to all of the main voice talent. Mike Myers, Cameron Diaz, Antonio Banderas, Eddie Murphy and Justin Timberlake all contribute a few comments, and there is some nice behind-the-scenes footage of the voice recording sessions. No great shakes here, but fairly informative nonetheless. Shrek Tech (10 minutes) - Dissecting the film's basic animation approach and techniques, this one features lots of quick cuts of all of the main characters in various stages of rendering, but little that goes beneath the surface. At least the snappy pace keeps things from getting boring. Lost Scenes (25 minutes) - There are four "lost scenes" in all, although the title of this feature is a bit misleading as these are not actual scenes but actually excerpts from "pitch meetings" with filmmakers Dave Smith and Hamish Grieve. They describe each scene, and there are some pencil sketches shown via split-screen, but no final renderings were ever produced. Big Green Goofs(2 minute) - This one's your standard blooper reel. Of course, all of this material is animated, so it's hardly "spontaneous," with various forced gags and intentionally "missed" lines. The animation is also all over the place, with most clips not up to the quality of the finished film, but rather rough renderings and the like. Shrek's Guide to Parenthood - Comprised of four 1-minute segments, this one provides exactly what the title suggests -- acerbic child-rearing tips that no parent would actually follow. Strangely, Shrek himself doesn't even participate. 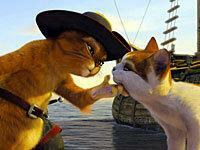 Instead, we get only Donkey, Puss in Boots, Pinocchio and Gingy. Donkey Dance (1 minute) - This mock music video features Donkey doing a routine to the old '80s chestnut "The Safety Dance" by Men Without Hats. Super slight, and not as cute as it sounds. Next up are several extras that live outside of the "Special Features" tab, most specifically geared to the tots. Merlin's Magic Crystal Ball - Although it's dubbed as an interactive "game," this one's essentially an electronic magic 8-ball. Activate it, and you're asked to think of a Yes or No question. Then hit enter, and Merlin will give you one of a few canned responses. That's it. Learn the Donkey Dance - Builds upon the aforementioned faux-music video, only adding instructions on how to learn all of Donkey's red-hot moves. How to Be Green (4 minutes) - This one's essentially a PSA for kids, with about a dozen tips on how to combat global warming, and other environmentally-conscious ideas. My Menus - This one's actually pretty neat. Here, you can select between six different menu designs: the default menu, or five alternates each based around a particular character in the movie (Shrek, Donkey, Boots, Gingy and the Gingerbread Man). Nifty. The fairy tale-meets-post-modern formula wears pretty thin with 'Shrek the Third,' but there's still enough here recommend it to fans of the franchise. It's also the kind of film kids will watch over and over again, so parents will certainly get their money's worth. Although I found the seemingly over-stuffed supplemental package on this HD DVD a bit fluffy and I remain baffled that DreamWorks continues to eschew high-res audio on A-list titles like this, the terrific five-star video transfer and a decent set of HD exclusives help earn this release an overall recommend.